Not far from the small town of Dinant, in the country of Liege near a home belonging to the lord of Celles, two magnificent oaks once grew. One of the two venerable old trees was felled in the year 1609 for lumber by a man named Gilles, a lumberjack. The worker who inspected the tree found in the interior a small terracotta statue of the Mother of God, enthroned, as it were, with three iron bars that served as a trellis. The old oak stood on the edge of a path taken by pilgrims travelling to St. Hubert. Apparently, at some time in the distant past, some pious Christian soul had placed the holy image in a hollow of the oak, as if in a niche. Then, over a period of time, the opening ​​the tree had made while it was still young gradually closed, and as it grew, the tree hid in its womb the precious figure. Over the years the bark of the tree closed upon it, and as the road became less frequented, the existence of the statue was completely forgotten. To honor the Virgin, the statue was subsequently displayed on the other oak, once again behind an iron grating, by order of Baron of Celles. In this new sanctuary the Mother of God was honored with the title of Our Lady of Faith. Those passing by did not fail to venerate the statue; and there were many unexpected healings. Graces of all kinds multiplied, and soon pilgrims began to flock to the area because of the dazzling miracles and very quickly a spontaneous cult grew. The statue was first placed in another oak, but it was almost thrown away by servants who thought it had no value. The local baron placed it by the door to his oratory at the Castle of Veves as pilgrims began to flock there. In this new sanctuary, the image of Our Lady was honored under the title of Our Lady of Faith, which was the name of the farm. The first miracle occurred in 1616. As a result of the intercession of the Blessed Virgin Mary an old man was healed from a painful and debilitating hernia. The canonical investigation prescribed by the Bishop of Liege was positive in its conclusion. A priest of the Society of Jesus had recently been sent to Gravelines. He worked diligently to cultivate souls, as if upon a fruitful vine, and by his sermons excited the people of the region to a greater love for the Mother of God. Seeing that this devotion had taken root, he met with the local Magistrate to discuss how to maintain and increase the piety of the people. It was decided that they should make replicas of the statue of Our Lady of Faith, made from the wood of the first oak. When the first was completed, the image was observed to have a great resemblance to the original. Received with great joy, it was to be placed in a large reliquary above the high altar in the parish church. By 1618 the influx of pilgrims and the publicity given to the place by the visit of the Archduke Albert and Isabelle in 1619 led to the construction of a larger chapel which became a Marian Shrine. The work began in 1622 and the church was consecrated in 1624, although only the structural work was completed. The ceiling wasn't finished for another dozen years, thanks to donations from pilgrims. A booklet printed in 1623 spoke of the remarkable healings in the invocation of our Lady of Faith in Gravelines. In one case a man named Peronne Joncheers was very sick with swelling for which doctors did not know the cause or the cure. Hearing about the miracles made by our Lady of Faith, he went to Gravelines, confessed, and heard the Holy sacrifice at the altar of Mary. Barely had he received Holy Communion than his pain disappeared entirely. He never suffered from the swelling again. In another case, Isabeau Carlier, had been burned due to clumsiness, becoming blind in the right eye from a hot iron. A surgeon said that the evil was without remedy. Isabeau recommended herself to Our Lady of Faith. She promised, if she were healed, to visit the chapel of Gravelines. The next day the surgeon checked her eyes again, throwing his scope as he was forced to acknowledge in his astonishment that the eye so damaged the day before had been miraculously healed, actually becoming clearer than the other. There are three more cases I would like to relate. In the first, a man suffered horribly for three weeks. For three days his pain was such that he was in delirium, and physicians held not even a glimmer of hope for him. The friends who surrounded the patient's bed, during a lucid moment, told the man about the graces obtained through the intercession of our Lady of Faith, whose image was venerated at Gravelines. The patient couldn't talk, but he responded with a sign that made it clear he was willing to make a pilgrimage there. At the very same time he began to feel much better, but not only did the Blessed Virgin give him back his health, but for three days she appeared to him at different times, surrounded by a dazzling light, and flooded him with heavenly consolations. Another prodigy was narrated by the father of Balinghem, which was the resurrection of a stillborn child. While the midwife had already prepared everything for burial, the grieving mother invoked Mary in the image of our Lady of Faith, Gravelines, and her prayer was answered. A life-giving warmth could be felt spreading into the child's icy limbs, who then began to cry and shake his small hands. The child received baptism, and now grows under the watchful eyes of his mother, for whom he is a constant consolation. Finally, in reading what's left of the Gravelines Church archives, there is mention of another prodigy operated during Lent in 1629. A ship captain had wrecked; the ship sank; sailors and passengers, everyone died; the captain alone was still battling the waves without hope of escape from death, because he was at least three leagues from Gravelines. In this urgent danger, he called our Lady of Faith; he vowed to visit the chapel, if she desired to come to his aid. Then, in an instant, unable to explain how it had been done, the captain was suddenly standing safely on the shore. He hastened to accomplish his vow, and he told with gratitude to all those he met of the singular protection he had been granted. During all of the 17th century the sanctuary had an extraordinary reputation. Pilgrims visited from all over. The veneration of Notre-Dame de Foy spread outside the country, taken overseas by the missionaries. A great treasure accumulated in Foy, of liturgical precious metal items donated by pilgrims. These offerings to God did not fail to arouse the lust of the godless. The wars of the century also did not spare the sanctuary. On several occasions, the church was vandalized and the statue was hidden in Dinant. 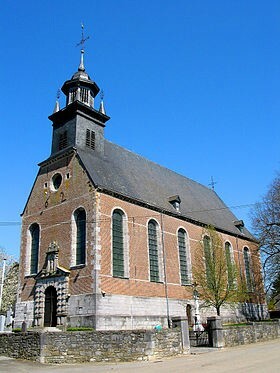 In 1696, the church was ransacked by Dutch confederates. Religious items were stolen or sold for profit. By whom and how was this precious treasure kept from the terrors of the revolution? We do not know, for in vain did they later leaf through the archives of the church seeking an answer. In vain were the elderly consulted. No one knows. However, the image currently honored at Gravelines is without a doubt the same as they honored before the days of the revolutionary upheaval. By the 20th century, the church was in a pitiful state and threatened with ruin. The valuable historical and artistic history of the church attracted the attention of authorities and the church was classified as having historical interest and restoration began immediately. Pilgrimages resumed, with the support of the Bishop of Namur. 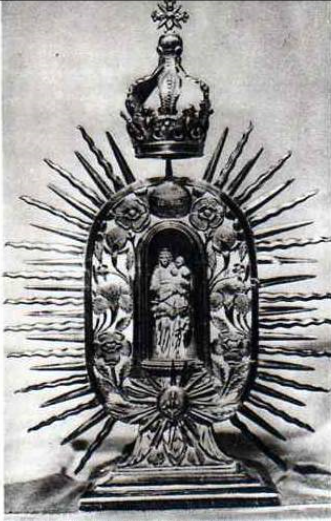 To mark the new beginning, Monsignor Heylen organized the coronation of Our Lady of Foy on 8 September 1909. 10,000 pilgrims were present. The celebration of 25 years of the reign of King Albert I was held in 1934. 30,000 people attended parades and religious ceremonies. To satisfy the pious zeal of the faithful, the venerated image of Our Lady of Faith was frequently reproduced. The oak, which for so many years had contained the image, served this purpose, as its wood was used to create other similar statues of Our Lady of Foy. The additional statues of the Holy Virgin which were distributed to churches in Bailleul, Dilingue, Gravelines, Huy, Lille, Lobbes, Marchiennes Montmartre, Saint-Omer, Oudenbourg, Reims, Ruislip, an D’Furnes, among others. These cities were honored to possess this image of Mary, and welcomed the statue, made of the same wood of the tree of Foy. In all of these various localities Our Lady of Faith began to work many wonders. There are now twenty-two statuettes from parishes around the world dedicated to Notre-Dame de Foy.